Nicholas Nicholas, " Because Of Fire At The Paper Manufacturer" b/w "Call Me Number Five"
On Wrong, his February release on Miscreant Records, Brooklyn-based Nicholas Nicholas sounded a lot like reverb lingering in a large hall after a pop show: a sound equally indebted to genuine emotion and the void left after. “Because Of A Fire At The Paper Manufacturer” b/w “Call Me Number Five,” his latest tracks, are no different—the artist’s hesitant lyrical delivery colors his intricate compositions with devastating, wry ennui. Nicholas Nicholas’ conversational, verbose manner recalls Jens Lekman and John Maus; like both, on this release the artist evokes a scathing self-consciousness. 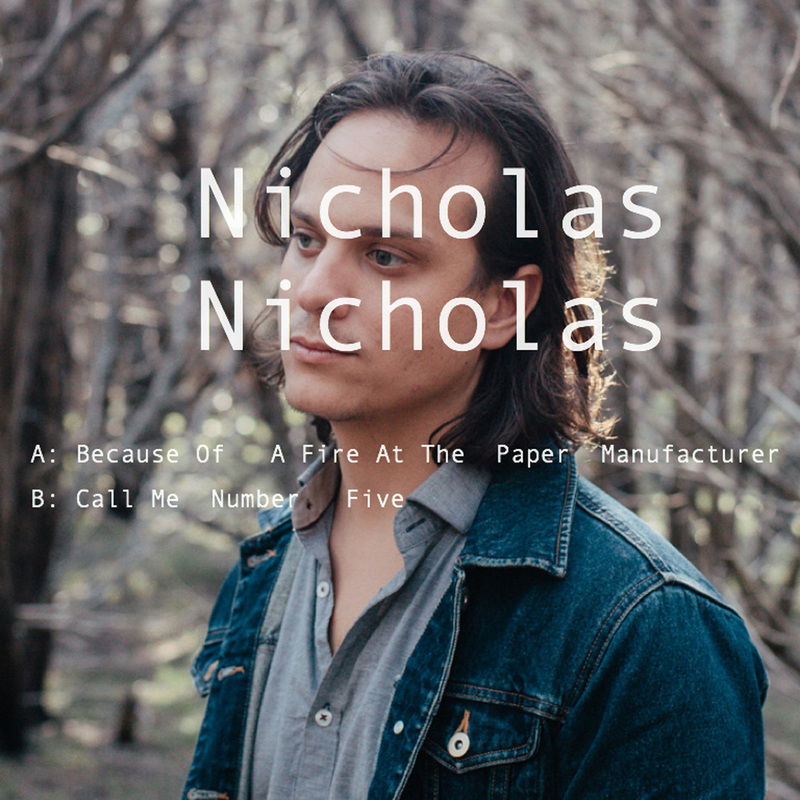 The release has clear A and B sides; the catchier “Because Of A Fire At The Paper Manufacturer” moves at a quicker clip towards a more satisfying pop breakdown than the more ballad-inclined “Call Me Number Five.” Both tracks, however, see Nicholas Nicholas harmonizing with himself over a steady backbeat, meandering guitars and orchestral synths. That intricate pop craftsmanship supports lines like “Because of a fire at the paper factory/we stay inside/and I describe/the ways in which I will succumb to Western vice.” Here and elsewhere the artist seems to find himself in command of his craft without the self-assurance that a mastered skill promises. As exemplified by the careless font atop the release’s well-lit photo, ennui everywhere strikes a discordant note. Nicholas Nicholas is Chris Masullo of Phantom Posse, the internet supergroup that counts among its ranks ILoveMakonnen and Eric Littman of Steve Sobs. The latter produced this release; the palpably silky warp and weft of his signature clean, shimmering reverbs and delays lends Masullo’s vast sonic palette a textural unity without muddying it. The impressive instrumental edifice makes lines like “I’m not trying to build the pyramids in Kansas/I’m just trying to get a sense of the grid” all the more devastating; the world is too much even for all those sweetly reassuring harmonics. You can stream Masullo’s tracks below. On his soundcloud, they’re tagged “pop for kitchens at night;” the artist might not know how to overcome ennui, but he’s pinpointed the field of battle.